Especially welcoming to beginners, the affable (and often good-looking) instructors go over the basics with newbies while the rest of the class warms up. 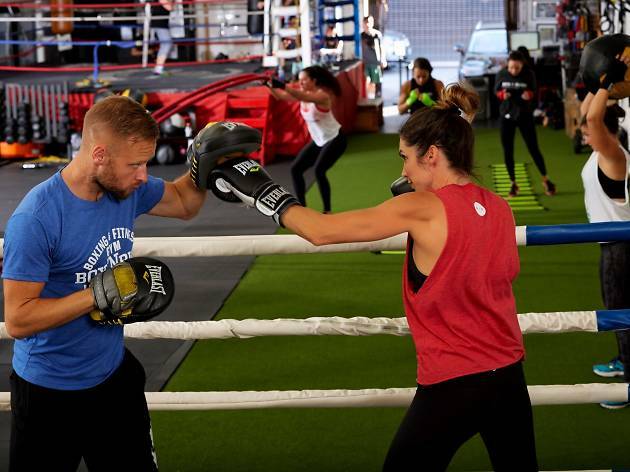 Then it’s straight into a heart-pumping circuit alternating bag work, conditioning (think stability ball pushups and agility ladder work) and sparring. Try to get to the Brentwood location if you can (there's also a Santa Monica outpost at 1654 Lincon Blvd)—it’s larger and plusher, with locker rooms boasting showers, towels, and a sauna. Bonus: Two hours of valet parking is free (tip included!) with validation. Pricing: $30 for one class, $169/month for unlimited access to all classes and facilities in both the Brentwood and Santa Monica locations. First class is free. Awesome workout! I just did the first class free at the Brentwood location and took a class with Alex, Anthony, and Josh - all three trainers were great, they really paid attention to beginners and made sure we were being safe/had good form. It was truly a full body workout and I was super impressed with the experience.